Cargo nets are an excellent source of cardiovascular and strength training. These nets were originally used to lift cargo on and off of ships. Soon cargo nets became a standard piece of training equipment for sailors. Today they are equipment that makes exercise fun for kids. Dig two holes 11 feet apart with your shovel and post hole digger. Make each hole 12 inches wide and 36 inches deep. Place a post into each hole and fill in the holes around the posts with dirt. Lay a piece of your rope between the holes to line up the post faces properly. Check the plumb of your posts with the level. Compact the dirt with the handle of your shovel. Lay the final post across the top of the uprights. Drill two holes through each end of the horizontal post. Make these holes so that they are 1 inch to either side of the center of each upright, giving you two pilot holes above each vertical post. Slide a lag screw through each pilot hole and drive the screws into the uprights with your hex driver bit. Drill a hole through the horizontal post 6 inches from the inside edge of one of the upright posts. Drill a series of holes across the horizontal post from top to bottom, placing each hole 12 inches from the last. Drill the holes from the top through the bottom of the horizontal post. Make your last hole 6 inches from the inside face of the opposite upright. Drill a series of holes into the inside face of both uprights. Make the first hole 6 inches below the lower face of the horizontal post. Space the holes in your upright posts 12 inches apart. Lay your pieces of rope side by side on the ground with the ends even. Stretch out your tape measure next to the ropes. Place a mark at 30 inches on all of the ropes. Make nine more marks on the ropes, with each mark 12 inches from the previous mark. Slide a rope through each of the holes in your horizontal post. Pull each rope through its hole until the first mark on the rope is 6 inches below the bottom face of the post. Wrap the end of the rope around the horizontal post and tie each rope off with a double knot. Slide one end of a rope through the top hole in one upright, wrap the rope around the upright post and tie the end of the rope off with a double knot. Hold the opposite end of the rope up to line it up with the top marks on the vertical ropes. Tie a knot at the junction of the marks on the vertical and horizontal ropes. Pull each knot tight before you tie the next knot. Slide the opposite end of the horizontal rope through the top hole in the opposite upright, wrap it around the post and tie it off with a double knot. Install the remaining ropes through the rest of the holes in your uprights while tying the ropes to the existing netting at your marks. 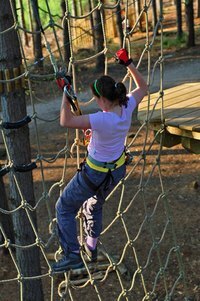 Test out your cargo net yourself by climbing up each series of holes in the net. If your net will hold your weight then the kids will be safe when playing. Check on the condition of your cargo net weekly to insure the continued safety of your children.